Arnold, Mo. 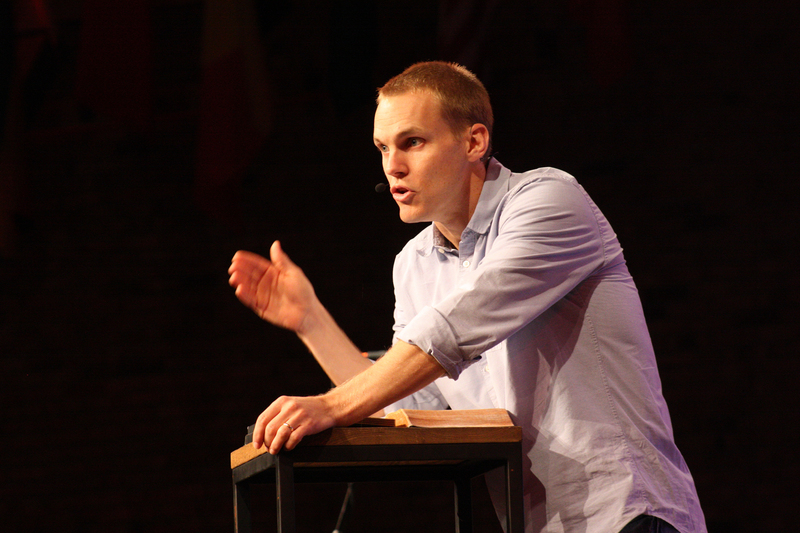 | Voice crackling with intensity, David Platt painted a picture of the current status of the gospel: With seven billion people in the world, even the most liberal estimates leave 4 or 5 billion who do not know Christ. And a couple billion of those have never even heard the gospel, added the recently elected president of the Southern Baptist International Mission Board. “If that’s true in the world…then we don’t have time to play games in the church,” he told the crowd gathered at First Baptist Church in Arnold, south of St. Louis. Hundreds of people gathered Oct. 6 for the St. Louis-area stop of the Send North America Experience Tour. The two-hour service, facilitated by the North American Mission Board, was part of a multi-city effort leading up to the national Send North America Conference in August 2015. Worshipers of all ages stood and sang before Platt came to the podium. He started his message with the bleak reality of billions of people who don’t know Christ. Then, he preached better news from the Book of Acts. Reading from the end of chapter 7 through the beginning of 8, he told the audience that it’s “ordinary people” through whom the gospel is spread. In a part of northern India known as a spiritual graveyard, Platt said, a chicken farmer and a school superintendent attended a disciple-making training session where they were assigned to go out into the villages and ask how they could pray for the people there. The two men didn’t expect success, Platt said, but they went anyway. Near the end of their time in the village, they met a man who said he had heard about Jesus, and wanted to know more. The man went to get his family so that they could hear the good news too. Around 20 people in the village came to Christ. A few years later, there are 350 churches in villages in that part of India. “Let’s put aside an unhealthy dependence on places and programs and realize that the gospel in ordinary people has power,” Platt said. But it’s not their own power. The extraordinary power of the Holy Spirit was at work in Acts and is still at work in Christians today, and through that it, believers proclaim the gospel, Platt said. Through the power of the Holy Spirit, early disciples also prayed and fasted, he continued. And they suffered. “How will we ever show the world a proper, clear picture of Jesus if everything always goes right for us?” Platt asked. Suffering makes sense in the life of a believer. Alan and Jean Lasley sat three rows from the front of the auditorium with their pastor and his wife and another couple from First Baptist Church in Red Bud. Platt’s simple delivery was the thing he would take away from the evening, Alan said. “Just be more intent on telling others about Jesus,” Jean said of what she had heard. A simple message for sure, and clear. As Platt concluded his message, he appealed to every ordinary disciple in the room. “In a world and a time and a place where God has put us, in a city where God has put you, let’s say we consider our lives worth nothing to us if only we may finish this race and complete this task the Lord Jesus has given us.